Don’t forget to renew your membership for 2016! We have recently refurbished both tennis courts at Hayne Barn Tennis Centre and added a brand new surface and bubble on Court 1 which looks Fab! Court 2 remains an outside court but court 1 is now ready to play in with brand news fans and doors. Book your tennis session now, places filling up fast! 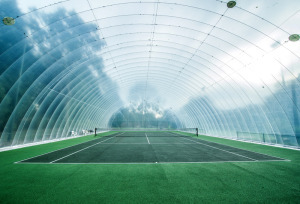 Court 1 is well under way of bring refurbished including a new court surface and weather proof bubble – very excited! Hayne Barn Indoor Tennis now has a facebook page. Keep up to all the latest news and events here.